“Lady Historian with a Futuristic Job” – Monica L. Mercado, Ph.D.
Monica L. Mercado February 10, 2014 February 11, 2014 Big News! 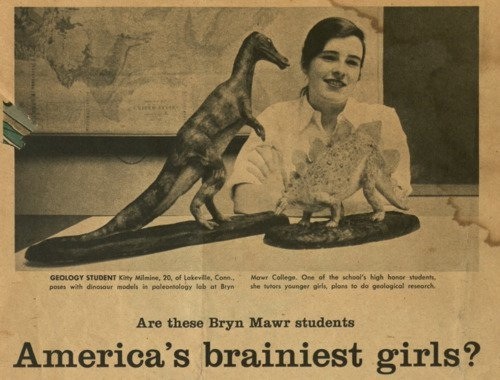 “Are these Bryn Mawr Students America’s Brainiest Girls?” n.d., courtesy Heather’s Blog. Readers of this site may remember I first got involved with the Digital Center as a presenter at the inaugural conference, “Women’s History in a Digital World,” last March. You can find my paper, and the work of so many brilliant people working at the intersection of women’s and gender history, feminisms, and digital history in the conference’s online repository – a part of the College’s larger open access project, Scholarship, Research, and Creative Work at Bryn Mawr College, which was established in 2012. I’m energized by the Digital Center’s mission, and I can’t wait to get started this summer. For more on my appointment, check out the Digital Center’s blog: Educating Women. And be sure to follow the Digital Center on twitter (@GreenfieldHWE) – there’s much more to come! Congratulations Monica! Such good news!